The moon was closest to the Earth in 2017 as a “super moon” on December 3rd. We enjoyed its brilliant light at our campsite on the South Coast Ridge of Big Sur, California. The moon was so bright the normal features that make “the man in the moon” were barely visible. The night sky darkened to a soft blue and no flashlight was needed to walk outdoors to gaze at this amazing light show in the sky. We only had one night to get away this trip, which was so worth the effort. We happily made camp while it was still daylight, parked our camp chairs to enjoy nature’s show while sipping whiskey and smoking cigars. 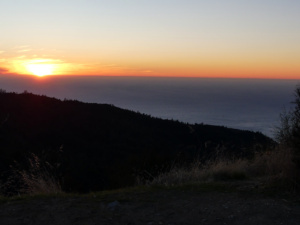 Our mountainside campsite gave us a spectacular view of the Pacific Ocean complete with a fiery sunset. The temperature was quite cold and we were grateful at bedtime to climb into our Teton Mammoth double sleeping bag, which has served us well in freezing temperatures in the back of our pickup truck too. This time being in our Alaskan camper, we had the luxury of a propane furnace making us snug as bugs. We have only had our camper since March and I continue to delight in the creature comforts it affords us. I smiled in the night as the wind kicked up and howled, gently shaking the camper, providing us with nature’s “white noise”. As we have grown older, sleep can be a challenge at times due to the fact we both snore rather loudly. We have recently discovered using a white noise machine to help us sleep at home. I had not plugged in the portable device in our camper, only to be accommodated by the wind maker Himself, Who delights in surprising us with a different gift each time we camp, if we simply are open to look. 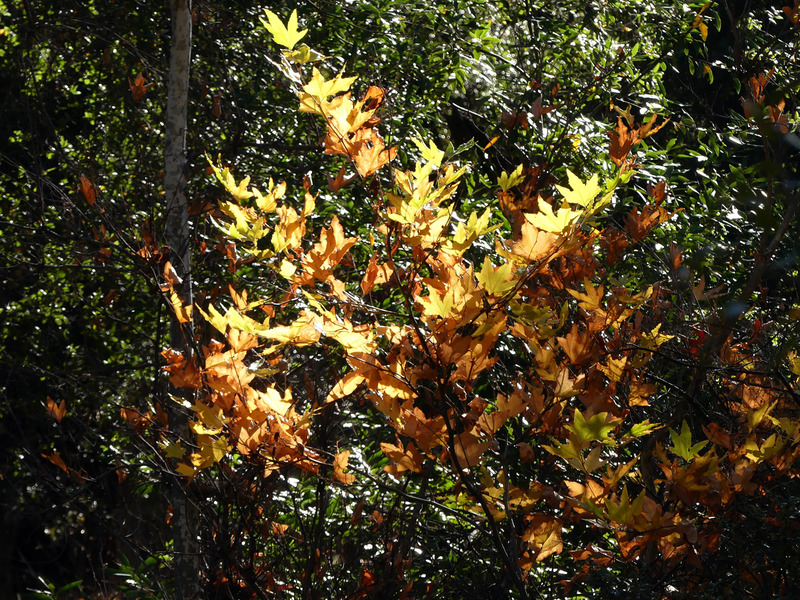 On our way out, the fall leaves were softly dropping as if it was snowing, in big piles all along Nacimiento Fergusson Road where it follows the gurgling stream bed of the Nacimiento River. 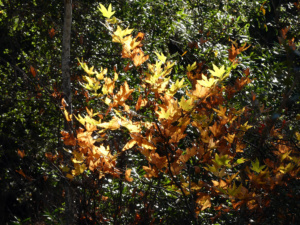 Sunlight lit the sycamore leaves ablaze with color in contrast to the bright green moss and dark oaks. The Toyon and Manzanita were adorned in bright red berries. This route is beautiful through all the seasons and a favorite place to get away. I went outside at the brisk wee hour of 2 A.M. in hopes to get a photo when the moon was at its closest. I was delighted to find Orion (my favorite constellation) on display next to the moon for a glorious display of the heavens. I tried to capture its beauty with my new gift of a camera, but alas I should have had a flashlight to see my camera settings were way off. I am posting my poor attempt in the gallery below, which cannot begin to give you the thrill of the beauty we saw. I will read my camera manual in hopes of doing better next time. Wondering how to get to get there? From U.S. Highway 101 traveling between Paso Robles and Salinas (California), take G18 and follow the signs to Mission San Antonio / Fort Hunter Liggett. After driving many miles past roads going to the lakes, vineyards and ranches you will reach the entryway into Fort Hunter Liggett marked with a parked military tank. Turn onto Mission Rd at the military base sign and kiosk. Be prepared to show your photo ID and proof of auto insurance if the kiosk is manned. Drive past the many training areas for several miles, then curve around the fenced off base, to reach a fork in the road with a green trestle bridge on the left and a sign directing you to the Mission on your right. As a side note, Mission San Antonio is well worth a visit. At this fork, turn left and cross the green bridge where the road will become Nacimiento Fergusson Road to the Highway 1 coast route taking you into Big Sur country. 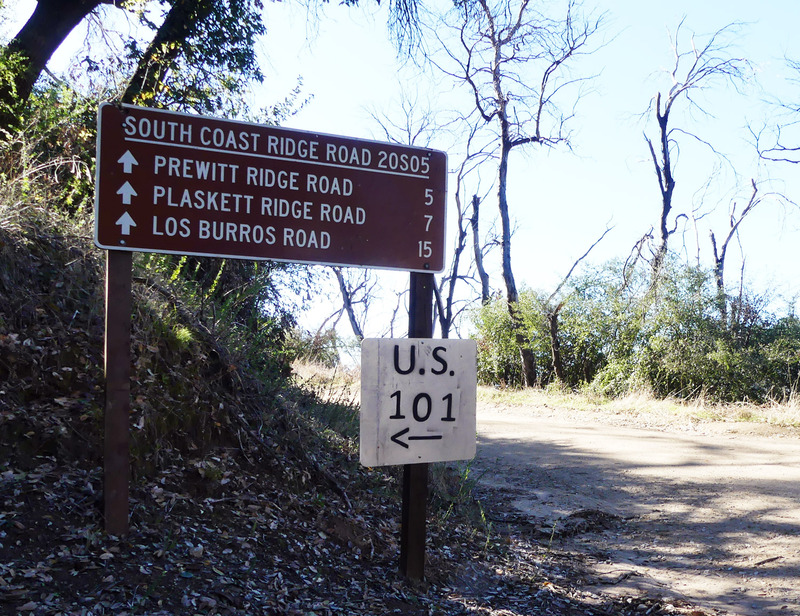 Ridge coast sign along Nacimiento Fergusson Rd. You will drive through oak studded hills and possibly see elk, coyote, hawks and wild pigs. After several miles the road will wind along a sycamore lined stream bed climbing the mountain range. You will drive past a couple of campgrounds and the fire station, still climbing the mountain road heading west. At the summit you will come to a fork with several road signs. North is the Coast Ridge Road with trails to Cone Peak. To the south is the South Coast Ridge Road 20S05 which is where we chose to find a scenic turnout to camp for the night. The ridge route itself is a 4×4 road that can be impassible in wet weather. This dirt road winds along the mountain tops with breath taking views. You will find many primitive camp areas, some with signs as you head south. We like to come out where the long narrow road leads to 23S01 along Willow Creek Road to Tree Bones and finally Highway 1 at Gorda. The trip from Highway 101 to Fort Hunter Liggett takes a good half hour to drive. From the military base to the fork for the ridge routes are about another 40 minutes. Give yourself 2 to 3 hours to make the trip from Highway 101 to find a campsite and be set before dark. Get your own map here. We also enjoy visiting the little hamlet of Gorda where Hwy 1 now ends due to the huge mud slide. Read more about camping after the mud slide. A photo I took months later of a "blue blood super moon."